It is said that in 17th century a Freanch physician named François Bernier was the personal physician for Mugal emperor Aurangzeb for 12 years. And france was one of the Europen powers have colonies in India. It may be an old story but now the relationship is growing much faster. France is ready for N-corporation with India. France backs India's bid for Permanent UNSC seat. These are not just some news articles published in media but also reflects the growing strength of relations between two nations. Recently Indian PM Dr. Manmohan Singh was the cheif guest for national day celebrations in France - which indeed a rare honour as France doesnt have any custom of inviting foreign heads except in few situations. 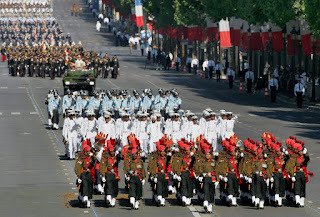 A contigent drawn from all three services of Indian armed forces, led by Marata light infentry marched down the 1.5 km stretch of Champs Elysees along with French soldiers. India and France also have deep strategic cooperation in defence sector. Apart from joint excersices India is also purchased Mirage 2000 fighter planes and Scorpene class submarines from France. Both countries shows more and more interest in defence, aviation deals and even set a bilateral trade target of 12bn Euros. France was very helpful to end the decades long neuclear isolation of India and both countries now are in the advanced stage of setting up 2 nuclear power plants in Maharashtra - a joint venture between NPCIL and Areva to generate 1650MW electricity. France is the one of the few nations who didnt condemned India's nuclear tests in 1998 and also one of the largest supplier of nuclear fuels to India. But the protectionist methods of France in agriculture and tough immigration laws are always a problem for Inian industry. Hopes that the scenes happened at the time of take over of Arcelor by Mittal steel will not repeat again. In EU France stood 5th in the list of trading partners with India, 7th in the list of investors. France accounts for only 2.05% of India's export to EU. Its here, we have to improve our ties, we have to increase our export to France as well as we have to sign more and more defence agreement with France. This not only helps French defence industry but also India as it will get more choice in buying arms and so the price will automatically come down. This will surely helps India to save money. Another notable sector is electricity production and distribution system of France, which produce almost 87.5% of electricity from Neuclear energy and even exporting electricity to other countries. France can help India in setting up more and more reactors to produce electricity more efficiently and economically. Let the friendhip progress further and further, helping eachother in international arena.